The Insider Content section on RussianSpaceWeb.com offers exclusive and advertising-free news, unique technical information and unseen visuals on the space program in the former USSR and related international projects. This regularly updated and ever-growing section focuses on the latest engineering developments in space flight not covered by other publications and provides unprecedented level of detail about the ongoing projects. After completion of the transaction, we will send you personalized access information. A critical element in supporting human expeditions to the Moon and permanent lunar bases would be a transport system for delivering crews and cargo to the surface from the orbit of our natural satellite. 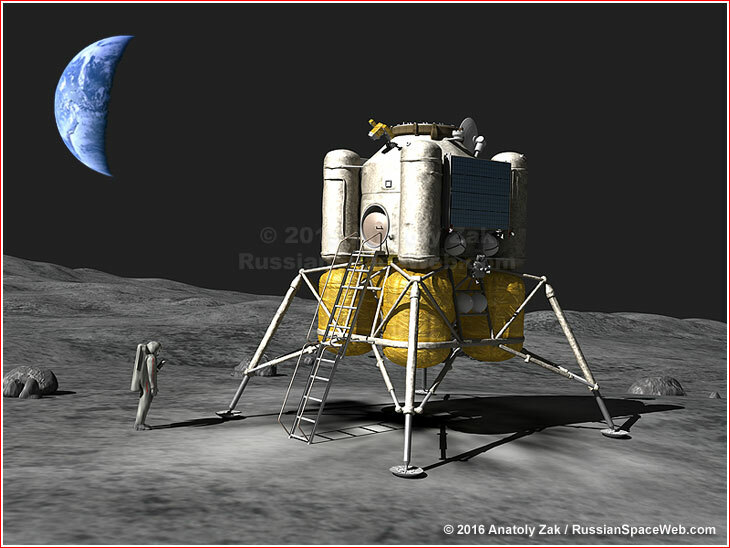 During the 2010s, Russian engineers conducted the first detailed studies in the post-Soviet era into the design and operation of the crew-carrying lunar landers. This is the first part of a series exclusively documenting the history of this work. New page: How far can the cis-lunar station go? New page: Russia quietly drafts lunar orbital station of its own! New page: How much will the cis-lunar station cost? New page: OneWeb: Proton's last hope? Update: Rogozin's stance: Will US-Russian cooperation continue? please contact: agzak@russianspaceweb.com. We keep all sources strictly confidential. Materials from the Insider Content section, including text and visuals, can not be published or distributed in any form without written permission from the publisher of RussianSpaceWeb.com. The subscription price is good for 12 months and a subject to change. Each login is per one user. A login used by more than one user is subject to cancellation.